Welcome to our Amaya free slots page where you can enjoy as much fun play on these video games as you want. See why this software developer is expanding so rapidly and why their titles are fast becoming some of the most popular in the world. These no download, flash titles can be enjoyed on all devices including Mac, PC, iPhone, iPad, and Android. Enjoy these all right here without having to register or download any software. Amaya Gaming are based in Toronto and have been expanding rapidly since 2011. They purchased software developers Chartwell Technology and Cryptologic which has seen their online portfolio expand. 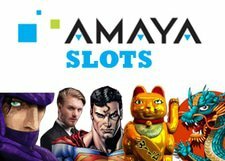 We have a variety of free Amaya slots for you to choose from and we know you are going to enjoy the amazing graphics that come with every single game. This software developer holds exclusive rights to all DC Comic characters including Superman, Green Lantern, Wonder Woman and more. You can choose to play some of these popular titles for fun below and you can also read all about Amaya Gaming in our software review where you will find a list of the top online casinos that run on their platform as well as where the best Amaya bonuses can be found. This software company works very closely with some of the world's biggest slots manufactures and as such they have exclusive deals that bring new slots online all the time. Amaya has worked hard to develop the online versions of many land based titles and the games come with some great features. Most of the titles that are available online have five reels and up to 100 paylines. Some of them even have up to 1,024 ways to win. There are plenty of excellent features too including free spins, wilds, scatters, bonus games and more. You can play all these popular games on our site for free thanks to the "for fun" mode that has been built in. This is a great way to play new titles and see how the games work before playing for real money prizes. Most people assume that progressive titles with their changing jackpots are the most popular games online. This is however wrong and it has been found that the most popular titles based on player popularity are actually down to the theme of the game and the return to player percentage. The higher the player percentage the more chances a player has of actually winning. On the right hand side you will find the top rated free Amaya slots. These are no download flash games that have a high return to player percentage. It must be pointed out that there are various setting for the RTP for Amaya. Cryptologic have average returns of 94.5% whereas Betsoft titles average at 96.35%. Aristocrat and Chartwell titles vary from 90% right the way through to 97%. Chili Gold is a Mexican themed game with stacked wilds, free spins, and scatter symbols and has a return to player (RTP) of 97%. Fortune 8 Cat is a new title that is based on Chinese culture and has 1.024 possible winning combinations. This title has a RTP of 97%. Other online titles with high RTP's include Cash Cruise at 97.95%, Frogs and Flies at 97%, Lost Temple at 97%, and Angels Touch at 96.5%. Progressive jackpot titles are always well sought after and whilst these do come with life changing jackpots, they also come with the biggest risk and the lowest return to player (RTP). Playing these should always be a personal choice but you do need to be aware that these online titles will have a low RTP. Aladdin's Legacy is a popular video slots title with free spins, wilds, and two bonus games but the return to player is only 95%. Other popular titles with low return to player percentages include 300 Shields at 95%, Batman at 95.41%, Green Lantern at 95.34%, and Battle for Olympus at 94.75%. The slots games from Amaya are fast and there are plenty of great features included. There is also an Amaya Gaming mobile platform that is being constantly dev eloped in keeping with the latest technological advances. The software includes autoplay options as well as 24 different languages for players to choose from. There are plenty of currency options to choose from too and all the games are available on most tablets and smartphones. There isn't a dedicated mobile app but that doesn't matter because the flash games are mobile responsive and can be played on all devices including iPhone, iPad and Android. Free Amaya Gaming slots are available to play all platforms including PC and Mac. They are also available for mobile users and the mobile suit is compatible with the iPhone and iPad. They can be enjoyed directly in your browser and all new titles are being made in flash as well as HTML5 to ensure that they are fully mobile responsive and available for all mobile devices. You don't have to download anything and your tap and swipe motions can be used to spin the reels. Want to play casino games for real? We have been tracking hundreds of online casinos and have chosen the following bonus offers. 100% SECURE - ZERO SPAM!